I just watched the entire US Nationals, got a lot of pleasure and emotions and ready to share them. 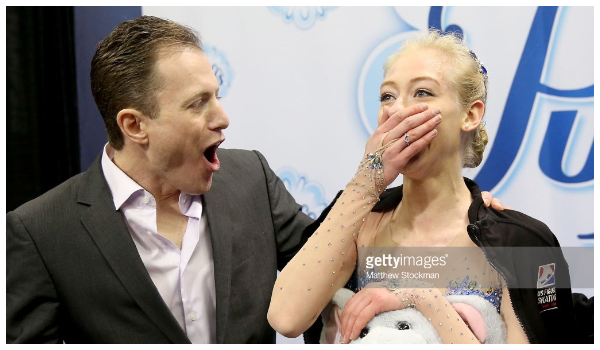 What I really liked about US Nationals is how emotional everyone was. I like when skaters shows their real emotions. Because I’m always a bit confused when, for example, Russian skaters after their Nationals say “Well, that was an important start, but more important competitions are ahaed, so I already don’t think about it”. Ladies were first, are they no longer US everything? Starr Andrews was the first who showed decent skating. Unfortunately she skated 14th, so before her there were 13 performances which were hard to watch) Audience was super grateful and gave her almost a standing ovation. Rafael’s girls upset him. But, I think that deep down he exhaled with relief, because less people will now distract him from Chen’s preparation for the Olympics. Mariah Bell performed the way she was performing the whole season. I didn’t expect anything different from her. But she’s a lovely skater and I hope she’ll stay for another 4 years. Diva Wagner really disappointed me. Her short program lost all spark…even amazing dress wasn’t able to help the situation. As for the free program, I think Ashley wasted too much time on Moulin rouge program, which we have seen thousand of times, it was impossible to get any new impression out of there. She should have been doing La La Land from the beginning of the season, because despite gorgeous dress and my favorite pieces from this musical, the program was empty, with lots of two footed skating, it wasn’t polished and actually wasn’t much different from Moulin Rouge. but I still don’t understand her PCS because others were not better. Karen Chen is our champion in discipline “Let’s change a program”. The girl had three new programs but returned to two old) But the US federation continues to believe in her. Well, she’s a bright girl. When her brightness and her jumps will be present at the same performance – she will be a star. It remains only to consult with astrologer when the stars will be in the right position for this to happen. Maybe US Federation have already done it and hopes that it’s going to be at the Olympics? Because I really can’t think of better explanation. I’m very happy for Mirai. She deserved the Olympics back in 2014. But both her programs just don’t touch me at all. Chopin is simply not the best choice for her, the free program is just a set of elements to a music, which Mirai does not pay much attention to. I suddenly realized that from all Nagasu’s programs over the years I remember only her Pirates of the Caribbean from distant 2010. But well done, she fought for every element. It seems that looking at all these “impressive performances” US federation thought “Ok, at least this one can jump.” Moreover, you can draw any PCS you want, proved lots of time at different competitions. So here she’s a new shining star of US figure skating – Bradie Tennell. Bradies’ free program is just a masterpiece and definitely deserves those scores they gave her. Especially for PCS. After all, there was amazing step sequence! I don’t have much to say about US pairs…their girls are so brave, because some their partners were really shaking during lifts. But everyone was well dressed. It’s also an achievement. Timothy LeDuc continues to amaze me. How easily he lifts his beautiful, but not small Ashley! What a strong man! Give me his contacts) I like this pair and I like their free program when they skate it with such sparkle and drive. I wish Tarasova Morozov could skate their FP the same way. Tarah Kayne Daniel O’Shea – another contenders for the victory in the nomination “The most original musical choice”. Our favorite Phantom of the opera in the SP and hit of this season “Swan Lake” in the FP. Here I need to say that US Nationals were extremely rich for warhorses, they used almost the entire disk “The best of figure skating”, some compositions even several times. What is going on with the poor swan? What does it suppose to mean? I need libretto! Alexa and Chris are still US “everything” in pair skating. Beautiful, gentle, with an amazing twist, wonderful programs…. but with no jumps. Isn’t anything can be done? What a pity( And yes, I was crying together with Alexa after their performance and I’m not ashamed of that. American men didn’t amaze with complexity of their programs, but all of them actually have interesting programs and choreo. For any taste! Classic, soundtracks, pop, club, folk….our favorite Moulin Rouge…..
Oh about that….do we really love Moulin Rouge that much? For me the main star of men’s event was Sean Rabbitt. He showed the dream latina of many dancers. Not everything turned out for Tomoki Hiwatashi but he’s interesting skater. I’m not impressed with Alexei Krasnozhon, this guy needs to work in choreo class more, now he skates like Max Aaron blonde edition. Speaking about Max…his skating was a disaster and he tortured my poor heart with that grey sweater. I can’t forgive that. I’m going to add Alexander Johnson and Tim Dolensky to my personal list “It’s pointless to expect great results, just watch for pleasure”. I feel sad for Grant, he skated well but did’t receive neither Four Continents nor Worlds. I think it’s unfair. I was almost 100% sure that both Jason and Adam will be in the Olympic team( Oh Jason, why do you need quad now? It’s not ready, I doubt you do it at least 4 times out 10 at practice. One good thing – that blue plush was burned, but replaced with something old-fashioned. And the best this fp was skated at b-event in simple black costume. I think it’s a sign from above. All the season Adam looked strong, confident and determined to get to the Olympics. So that really was a shock. I don’t know what happened on that salchow but the rest of the program he skated with fear on his face….I’m happy that Adam is going to the Olympics, but I would prefer he replaced Zhou not Mainer who delivered two great performances in the right time. There’s nothing to look at in Zhue’s programs except for jumps and he loses 20 points on this jumps…. How do you think is it possible to ruin the chic program only with a costume? It’s possible. Proved by Nathan Chen, who skated his short program without his curls and wearing a wetsuit. Nathan, you know they’ve already filmed the remake of “Point Break” without your participation. I understand – Vera Wong and all stuff like that … but those naughty curls and a simple black shirt were the soul of that program, it’s charm ……and now it’s lost. Another wetsuit was in the free program….. it’s stylish, but this zipper …. I was distracted the whole program. New costumes not only killed the charm, they showed things that it’s better not to show – that the guy has problems with posture and actually still a skater who just recently came from juniors….But, nevertheless, so far this has been the most impressive performance among the national champions and a claim for the Olympic medal. US Nationals was dramatic and brought a lot of surprises. But ice dance is ice dance and I for sure didn’t expect any surprises there. Who would have known….But I got so much pleasure from watching ice dance! It was the best part and I liked almost everyone. Porgebinsky – Benoit – tall, beautiful, spectacular. But they need to run away from Shpilband, and Eliana from her hairdresser, because it’s hard to notice all of this behind this recycled programs made in hurry. I think Parsons had the best pattern of the Championships and I like their short dance a lot. FD has interesting idea but it lacks something. Speed, power, more impressive lifts. As for MacNamara – Carpenter, I prefer their FD. I think that despite all the lack of nice lines, they really caught the mood of tango. And I think that Quinn will grow up into a very good partner! And the culmination, the joy, the tears, the drama … ..Oh, I love ice dance! Turned out Shibutani are not iron and have nerves. After mistake they skated their free dance in a half-shocked state. I noticed that they added Fix you to the second half and I think it’s a mistake. It’s only shows that they want to reach the level of that successful dance, but it doesn’t work out. Chock and Bates’ free dance on the contrary started to make more impression. As for Hubbell and Donohue, I think this season they have the best dances in the US team…and maybe in the world. Oh and I really hope that Canadian Nationals will pass without surprises. Your sarcasm on Bradie is A Game and your whole review was very funny to read! Thanks! The more I think about it I think Ross made sense for the Olympics and Vincent for Worlds. Olympic placement doesn’t have any bearing on next year. I have no confidence that Ross can skate that well again. It hasn’t happened since 2003 but still, he skated great. I agree, they both are not medal contenders, so does it make big difference is’t gonna be 8th, 9th or 10th place? I love Chock and Bates FD. My heart breaks for Ross Miner, I really wish he would have been put on the team. I certainly agree about Jean-Luc! And I love their free dance too – he and Kaitlyn were so elegant. The top 3 couples are only 1/2 point apart – anything is possible. So happy for hubbell and Donahue. They just sizzle on the ice.